If you are looking for something to serve on Fat Tuesday... look no further! I present to you the pitifully easy (but oh-so-tasty) Cajun Chickpea Cakes. Before I get to the recipe, I have a confession. I've wanted to make chickpea cakes since they were featured on Top Chef (I'm rooting for Carla btw). I had googled a little and was daunted by the recipes I found... everything was exceptionally "egg" heavy and while I know vital wheat gluten acts as a great egg replacer in "patties" I'm trying to cook gluten-free these days... But then Vegan Dad posted this recipe and I realized I'd over thought the dish. Chickpea cakes can be simple and they can come straight out of the pantry! Quick and spicy chickpea cakes worthy of a creole occasion. Chef's Notes: These cakes are a bit dry since they're fat-free. 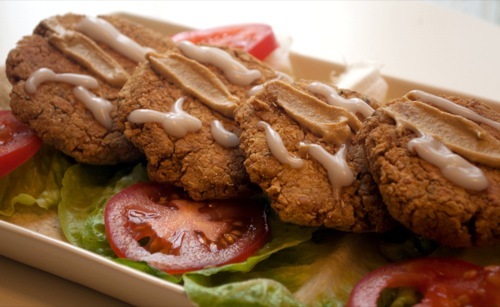 Serve topped with spicy Dijon mustard, fat-free vegan mayo, plain soy yogurt, dressing, hot sauce or fresh tomatoes. Preheat oven to 350F. Line a cookie sheet with parchment paper and set aside. Place chickpeas in a food processor and pulse about ten times, until chickpeas are coarsely chopped but not pureed. Transfer chickpeas and all remaining ingredients in a mixing bowl and stir to combine. Roll 4 balls, then spray lightly with cooking spray. Place balls 4" apart on the cookie sheet and flatten gently with the palm of your hand. Lightly respray the cakes and sprinkle with additional salt if desired. Bake 12-15 minutes, until thoroughly warm and a bit crispy. Chef's Note: Whole-wheat flour may sub for chickpea flour and soy sauce may sub for tamari.